AURA is a multipurpose HTML template, created by people with 8+ years experience in cute websites development. It’s fully responsive, has moduled structure. You will define what you want to use on your website.We have tried to create something that is better than bootstrap. Our goal is to save time for our customers, we will work hard providing support, and making our theme better and better in future. New page templates, headers and footer variants, new UI elements, CMS implementations are coming soon. Theme has 5 base color schemes. In addition to this, each section of a page, developed with our theme could be one of 5 color schemes (not only light and dark, but grey, white, dark, base color, and parallax). You can for example set dark skin for 1 specific section, and grey for another one. 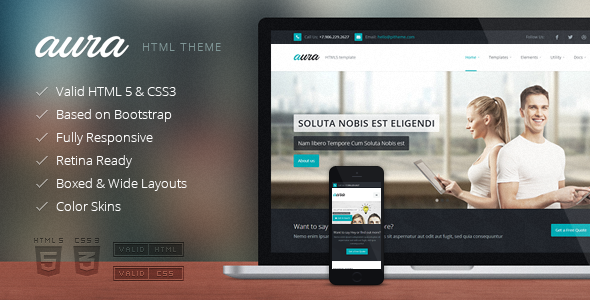 Theme contains ~100 HTML page examples. Item Reviewed: Aura Responsive Multipurpose Template 9 out of 10 based on 10 ratings. 9 user reviews.